Chiara Terzuolo – Jarman International K.K. Favorite Thing About Living in Japan: The incredible public transport, Shoutengai traditional shopping streets, and fresh tofu. BIO: Chiara has spent her whole career in Japan, working in marketing, content management, PR and as a freelance writer. Whether tailoring user-friendly content for sites, writing articles or giving presentations inside and outside the boardroom, she loves to see her audience light up and get engaged. 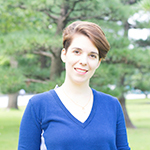 A bilingual speaker of English and Italian, as well as fluent in Japanese and French, she offers insights from both American and European perspectives, combined with a deep understanding of Japan and its culture.